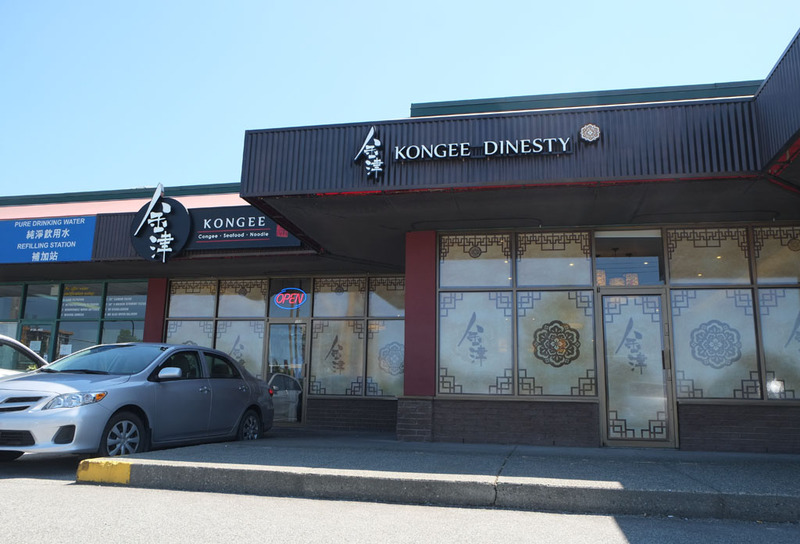 Kongee Dinesty is located in the same strip mall as Prata Man (Garden City and Capstan Way). Last time I was in this area was 10+ years ago when we tried Prata Man and weren’t impressed. Prata Man, surprisingly, is still there. 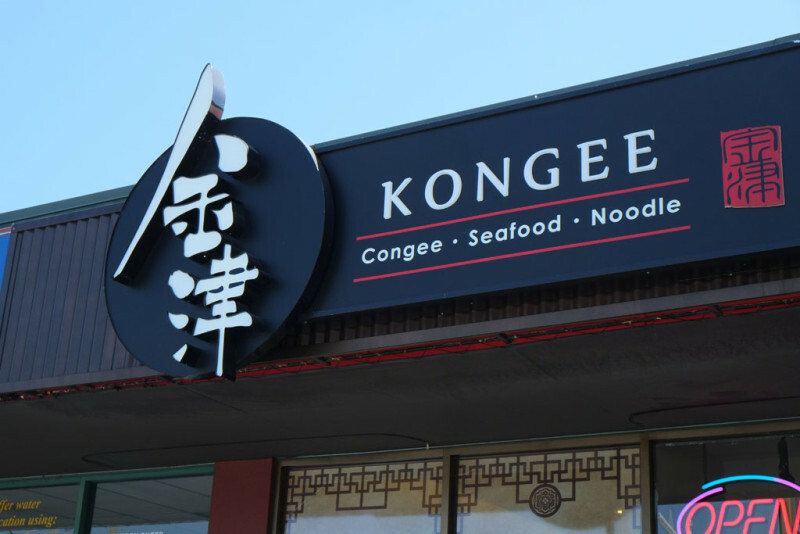 They do know how to spell “congee”, but they spell it with a “K” in their name on purpose. Ok. 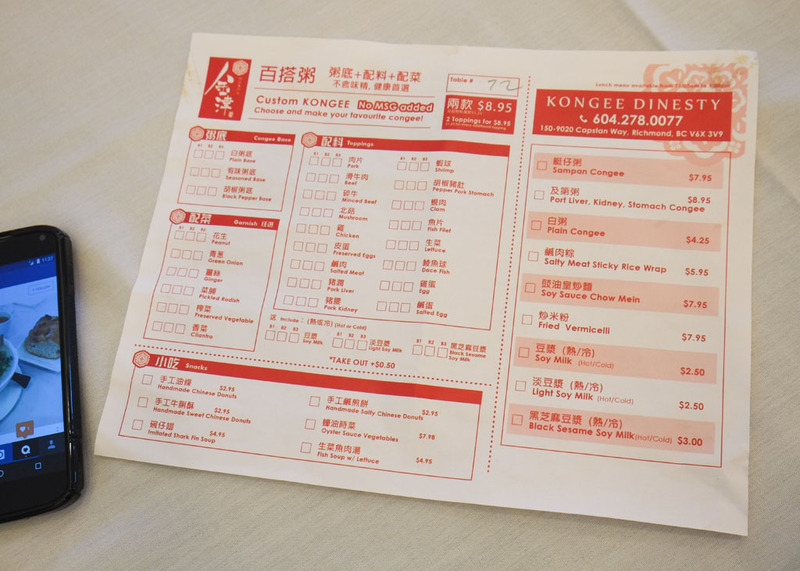 The ever-popular order form menu. 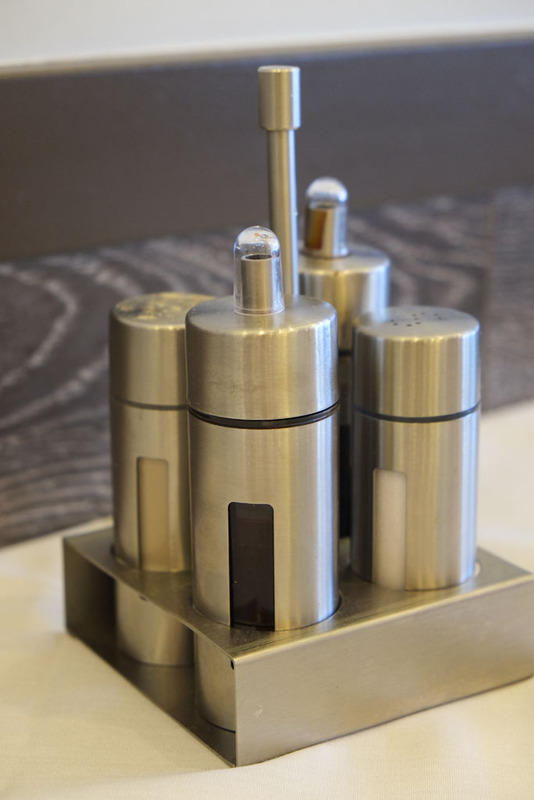 Not just for dim sum restaurants anymore. You can do your own custom congee where you choose your base, garnish and toppings, or you could choose one of two preset congees. We ordered the second congee on the top right, “Port” Liver, Kidney, Stomach Congee. They totally mean “pork”, not “port”. 😛 They also pride themselves on making fresh handmade chinese donuts, so we ordered the sweet version. 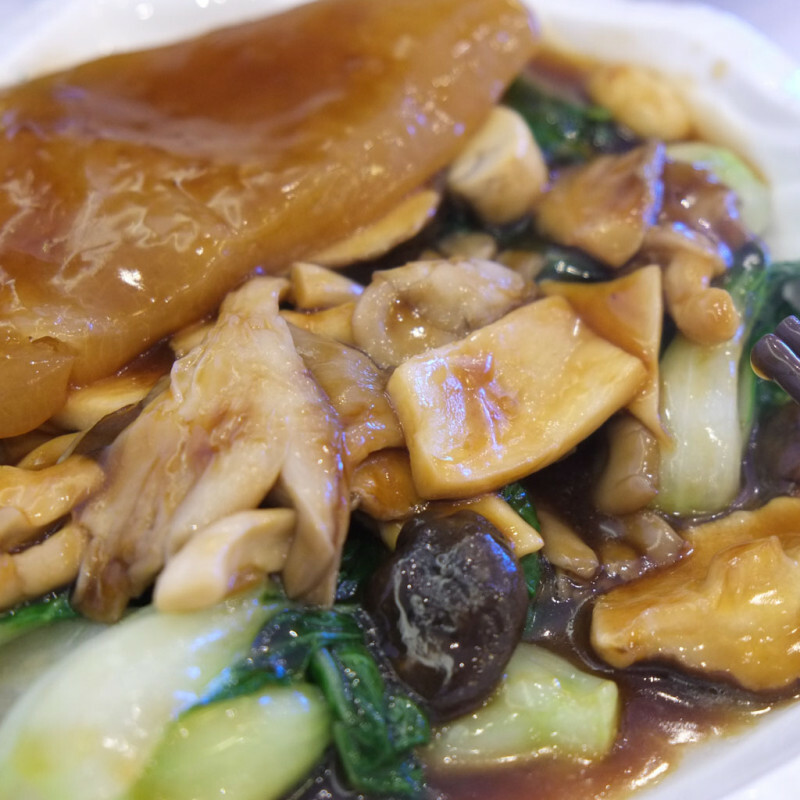 And we got the last dish in the middle column, Mixed Mushroom with Pomelo Skin(?!). Tableside condiments: white pepper, soy sauce, salt, and red vinegar. I like how there are little plastic caps on the liquids. Never seen that before. Handmade Sweet Chinese Donuts. 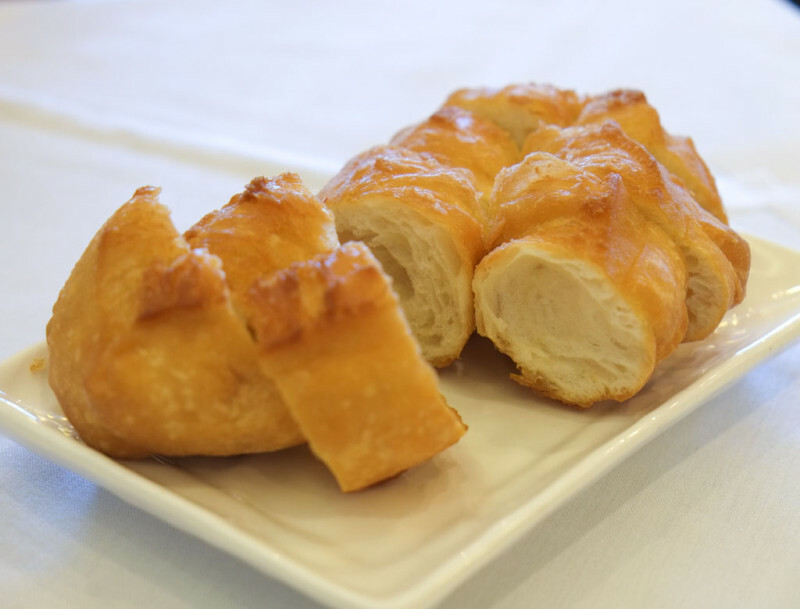 A bit denser and heavier than the usual greasy, airy Chinese donuts. Just a hint of sweetness. Actually tasted good with the congee. They also do a plain version and a salt version. I’d prefer a lighter donut but some people might like the heft and body of this one. “Port” Liver, Kidney, Stomach Congee. I’m not gonna let their spelling mistake slide. 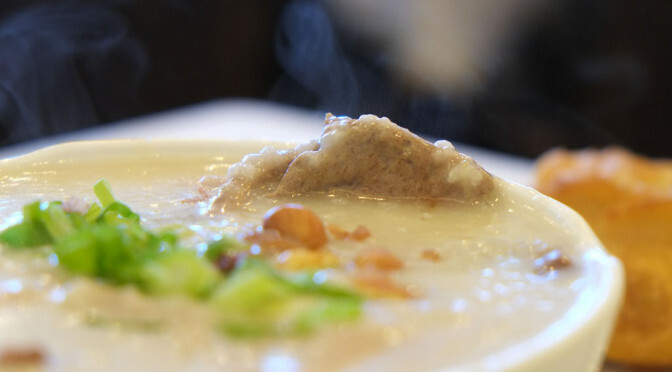 The congee was off-white and tasted full and flavourful without being salty, which leads me to believe that they use some good stock to make this congee. 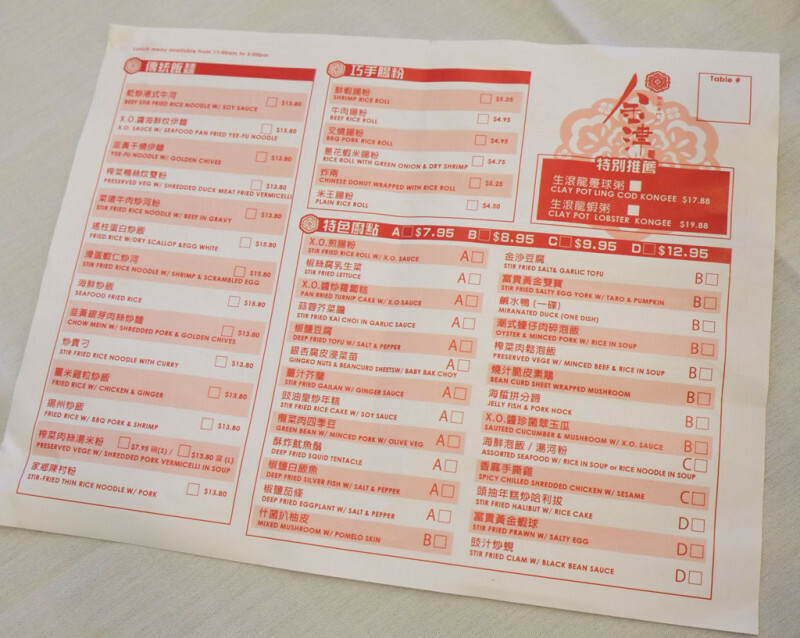 Their menu shouts, “No MSG added”. The texture hit that good middle ground. Not too runny, not too thick. 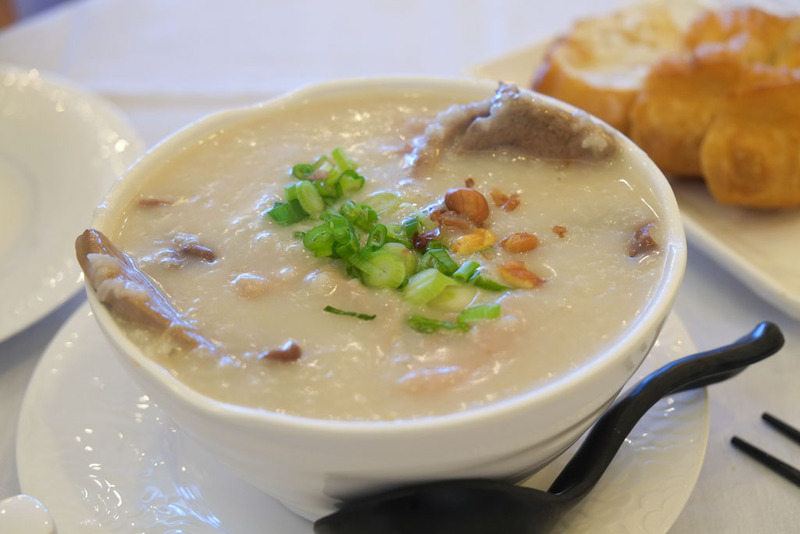 Congee with innards is Wicca’s favourite kind of congee. If you can’t stand funky offal, stay away from this one cuz the funkiness was out in full force. But we really enjoy offal so this was heaven. 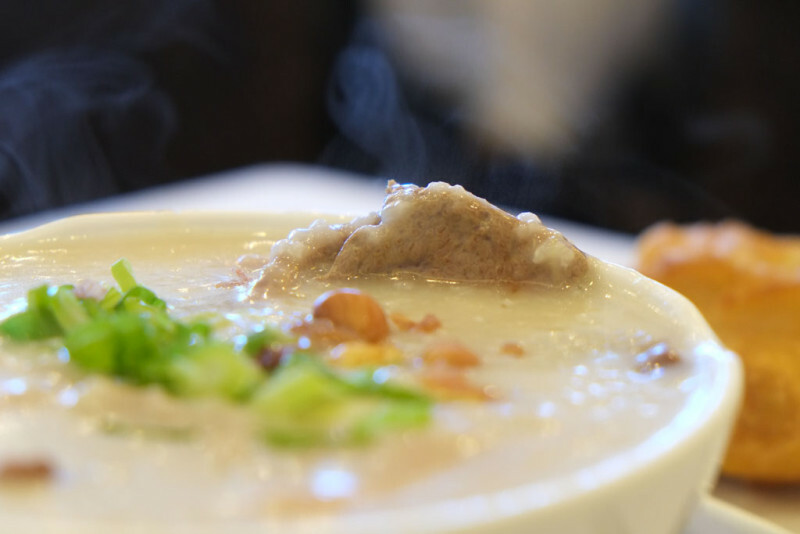 White pepper tastes really good with congee. It’s got a funk of its own that brings more funk to the table. 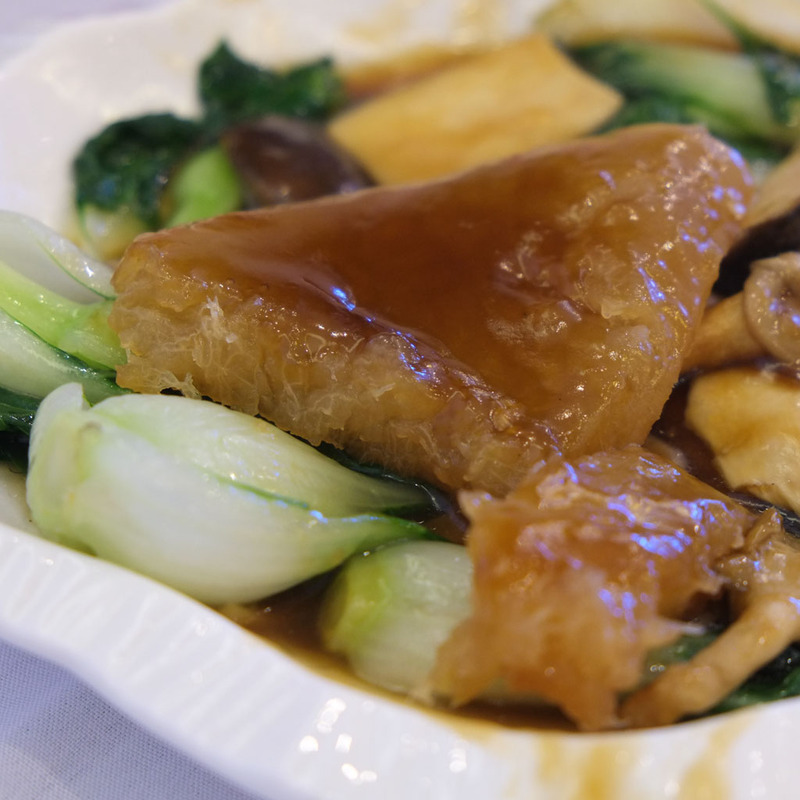 Mixed Mushroom with Pomelo Skin and baby Shanghai bok choi. That weird-looking, crab shell-shaped, glossy thing on top is the pomelo skin (rind). Pomelo is a big Asian grapefruit. I’ve never seen the skin actually cooked and served in a restaurant before. But I love how it’s one big intact piece, almost treated like a poor man’s sea cucumber or abalone. The “normal” part of the dish: a variety of mushrooms. We saw oyster mushrooms, king oyster mushrooms, shiitake, and white button. 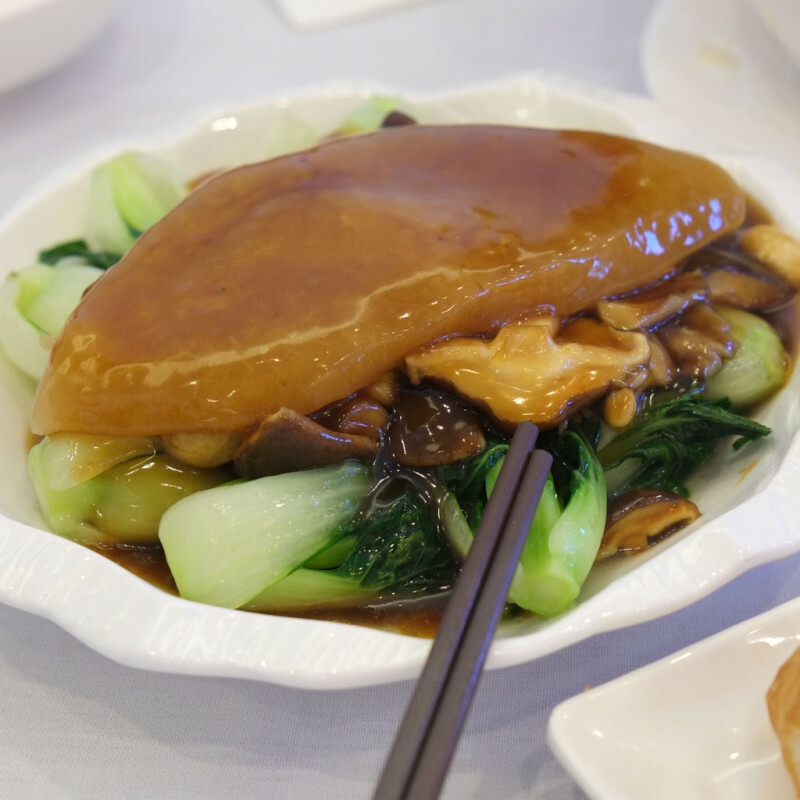 The sauce was flavourful and probably contained mostly oyster sauce but melded and mixed in a way that just screams classic Cantonese brown sauce. I’m not sure if they avoid MSG in their non-congee dishes as well, but it tasted like it didn’t have much (if any) MSG. Still very flavourful and shows that you really don’t need MSG if you have good ingredients than can speak on their own. Cross-section of the pomelo skin. The texture reminded me of winter melon with a smidge of sea cucumber but with a texture of soft fibrousness. Wicca ate it but didn’t quite enjoy it. I liked it a lot. I’d order this again for friends to try, just to show them that nothing has to go to waste and can be eaten with a bit of ingenuity. 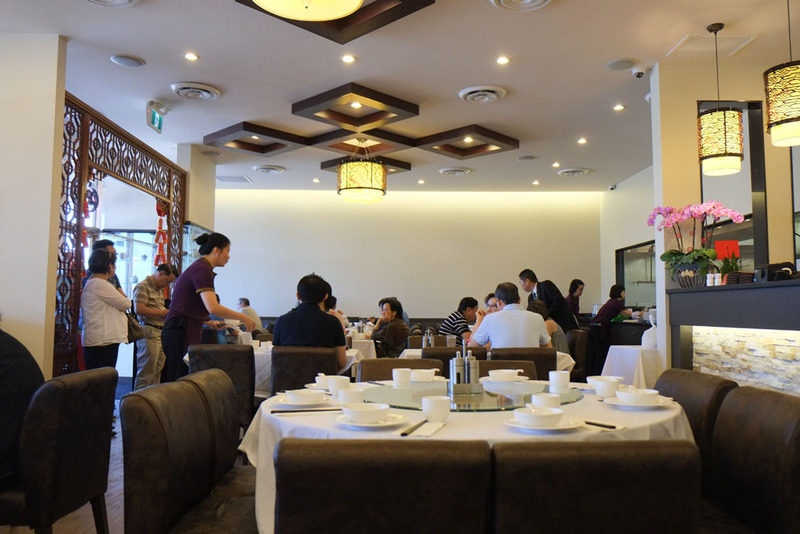 Red Star on Granville used to have a pomelo skin dish at dim sum; may be worth checking.